In June of 2013, we moved into a brand new house. I was so excited and instantly got busy with decorating the place. We had some money budgeted for new furnishings and home accents and since I was planning to go a completely different direction style wise than ever before, I had a lot of work to do. 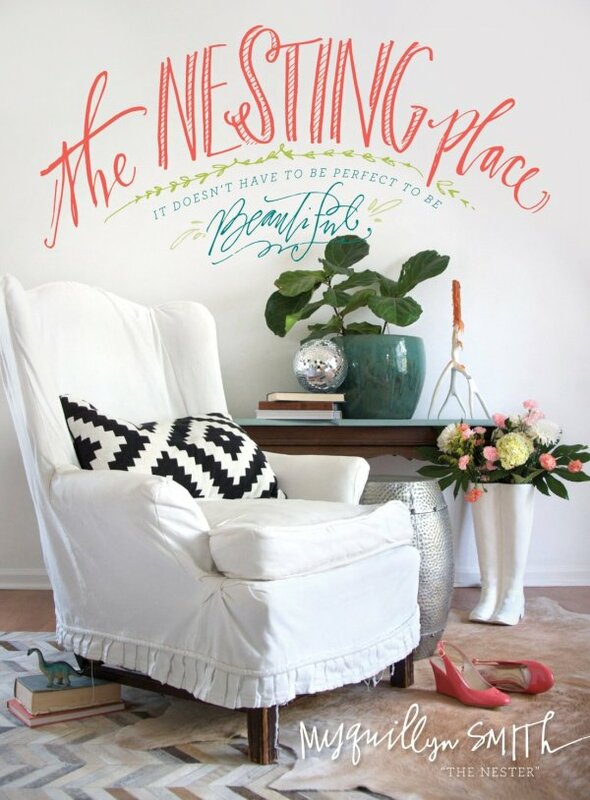 Really what lit this fire inside of me was reading the book The Nesting Place. I’m about to read it again because I just love it. She encourages us to decorate how you like. To surround yourself with things that make you happy and to realize…it does not in any way shape or form, have to be PERFECT. Through her practical tips and advice, she woke me up to the realization that this is my home and it should be a place I absolutely love. But I can decorate it imperfectly. Doing this helped me tremendously. I now have a list I can work from as I turn our home into somewhere that’s relaxing, fun, creative and clutter free. 2. Pin (I know, I know…ugh you Pinterest!) creative DIY ideas that are super cheap and fun. This might seem to be counter productive, since it’s Pinterest that can make one feel like their home is the ugliest one on the block, but it’s also chock full of some incredibly smart, cheap, easy and creative DIY decorating ideas. 3. Use my kids’ artwork. Your kids’ artwork is THE best art you could bring into your home and decorate with. They love it because it makes them feel special. Your guests love it because it makes them say “Awwwwwwww” and you love it because you get to look at it and also say “Awwwww”. You can do this in a way where it looks really nice. All you need is a frame and a mat. Place their drawing or painting in there and voila!, instant art work. 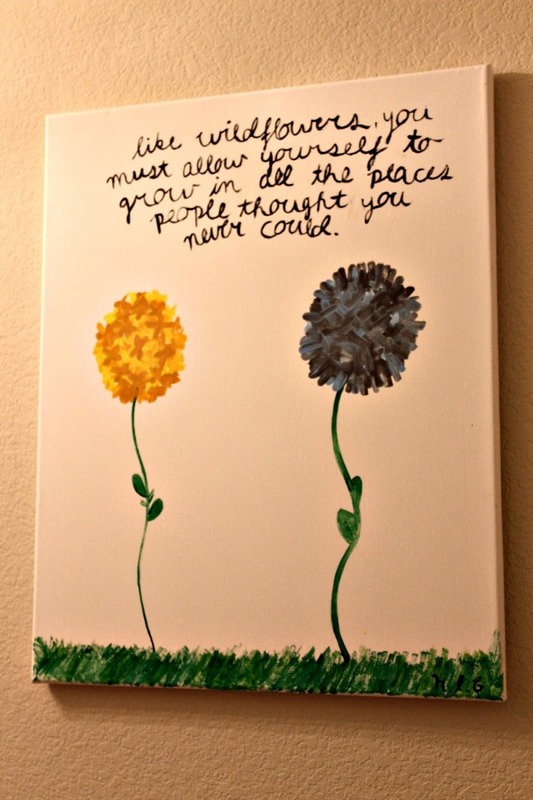 I had a blank wall in one downstairs half bath that was driving me crazy, so instead of spending our grocery money (just kidding honey…I never do that) on art, I asked my daughter to paint something on canvas. She already had the canvas and paints. She loves to paint and I couldn’t be more proud to display her art. Here it is. 4. 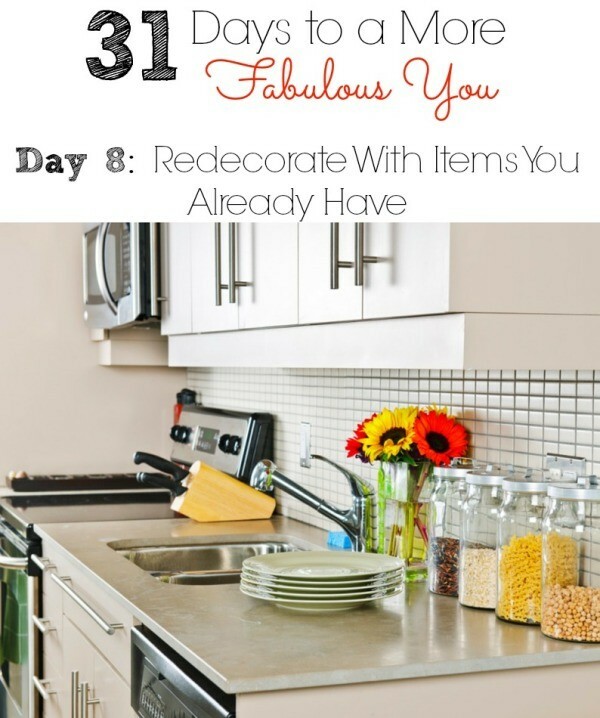 Make a note of extra items I have or items that could be used in another room of the house. I have this gorgeous yellow urn that I keep moving around. (Don’t worry, there’s not a family pet in there or anything.) First it was on the floor in the living room, but considering our living room can turn into a basketball court or soccer field within a matter of minutes, it wasn’t practical. Yes, it was hit. No, it didn’t get broken. Then I moved it to the landing on our stairs. No one sees it and it was sitting there like it was in time out. Currently, it’s sitting on the bar area between our kitchen and living room. Yes, it will probably get moved again. My goal is to work on one room at a time and “finish” decorating by this summer. That’ll be our 2 year mark. Of course, I’ll never be finished decorating, because I know myself too well. But I want to have a space by this summer that feels finished and a home that is uniquely…US. Do you feel the same about your home? Maybe you’re surrounded by unfinished projects and a home that doesn’t reflect you? Or maybe you were here at one point and you decided one day to just get busy and now you live in a space you’re proud of. Let me know! Stay tuned for Day 9…. Great post! This is exactly how I approach decorating. And REdecorating. Because I’m never done either. Love the yellow urn tip! Thank you Kimm! I have a long list to tackle, but I’ll do it a day at a time. With my stash of fabric, yarn, and other crafting supplies it shouldn’t be TOO hard to get this place looking nicer for very little cash.